Žygimantas Kestutaitis [Ukrainian: Жигмонт Кейстутович; Zhyhmont Keistutovych; Polish: Zygmunt; Latin: Sigismundus], b ca 1365, d 20 March 1440 in Trakai, Lithuania. Grand duke of Lithuania; younger brother of Vytautas the Great. After Vytautas died, Žygimantas supported his cousin, Švitrigaila, who ascended to the throne and cultivated alliances with the Belarusians and Ukrainians in order to maintain an independence from Poland. In 1431 Žygimantas made a bid for the throne and, with the backing of Polish nobles, captured Vilnius. In 1432 he proclaimed himself grand duke. At the same time he ceded Podilia to the Poles, and in 1438, after six years of civil war, he was forced to abandon Volhynia. During his rule Žygimantas recognized the equal rights of his Orthodox subjects and introduced Magdeburg law in Vilnius. 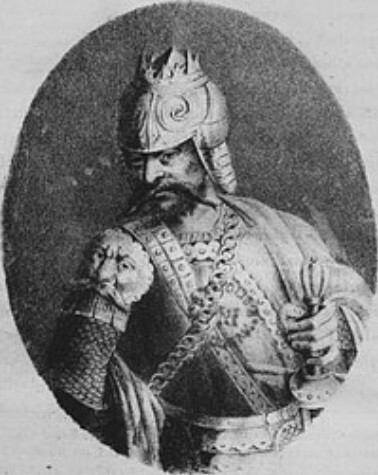 He was assassinated by conspirators loyal to Švitrigaila. Referrals to this page are found in 4 entries.